The drive down the east side of the top end of South Island to Kaikura was through very parched hills and mountains on both sides of the road until the road came to the coast. Then it was the Pacific Ocean on one side and the hills and mountains on the other. The road passes a fur seal colony and stopping, we could see the seals basking on the rocks. 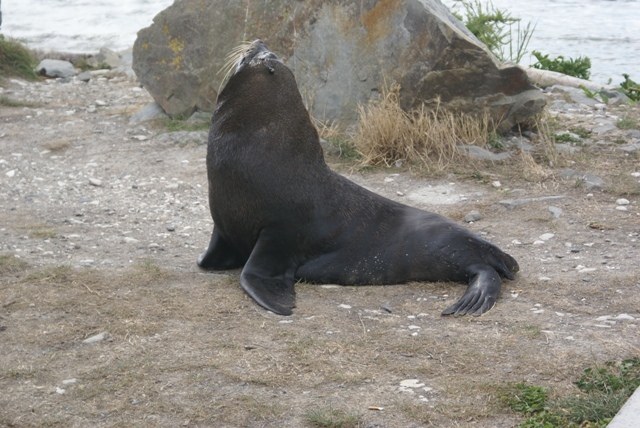 This got even better when we reached Kaikura as the seal colony there was right by the car park. Apparently the car park was built before the seals decided to return to this particular spot and stay, so there are notices to mind the seals when driving into the car park. 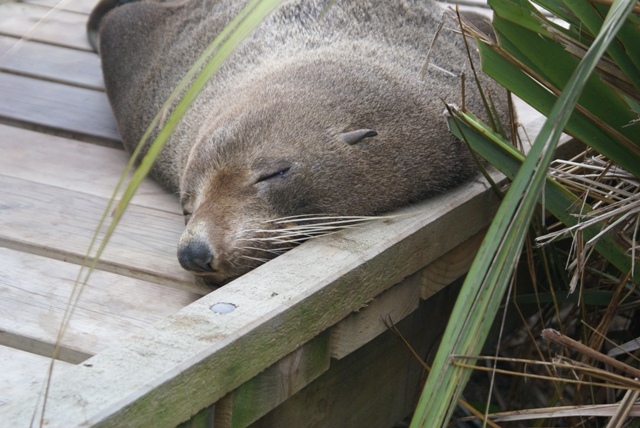 It was a little like the Galapagos sealions, the fur seals were ignoring people walking right by them and slept anywhere they fancied, be it on the beach or on the pedestrian board walk. So lots of pictures of seals! 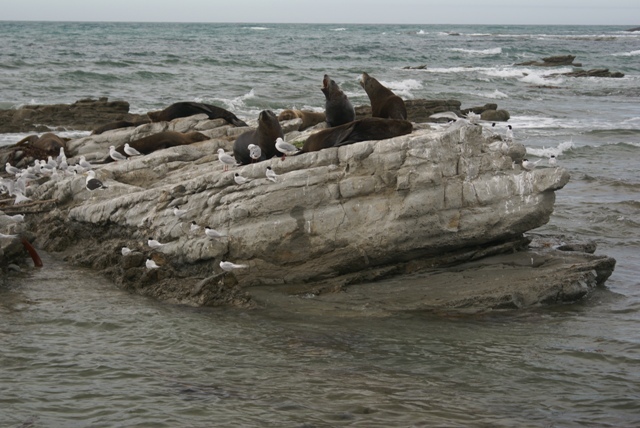 Kaikura is famous for the bird life and the whales that can be seen just offshore, so there are lots of tours on offer. We decided to go for the one concentrating on seeing albatrosses. We had seen a couple when sailing down to Napier. They flew close to the boat, but didn't stay long. The tour we took was in a smallish boat that would probably hold about 12 people, but the roughish sea had put others off, so it was just the 4 of us and we had our own private tour! 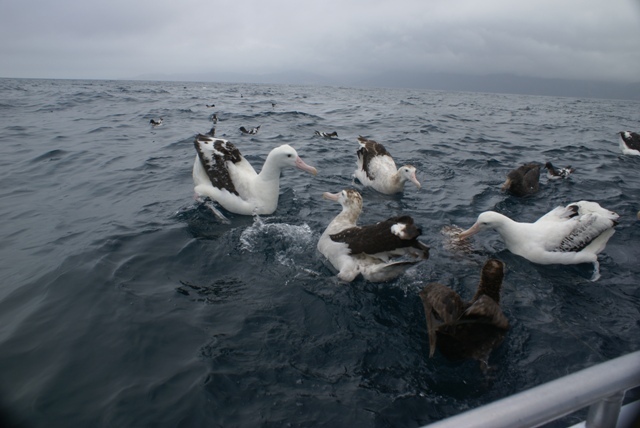 The boat headed well out to sea and, with a little help from some titbits (a sizable lump of fish meat), allsorts of seabirds came calling. 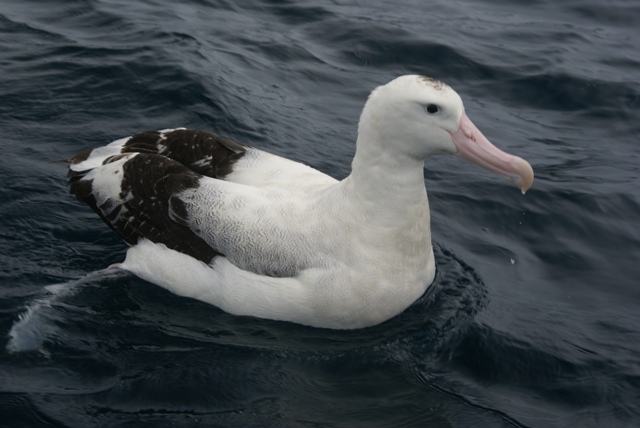 Giant Petrels were the first on the scene followed by terns and others, but it was not long before a number of Wandering Albatross came gliding in. They are so graceful in the air and have the largest wingspan of any bird, around 10ft, but once in the water you see how big their bodies are - the size of turkeys! We had up to 8 swimming around the boat, some no more than a hand reach away. 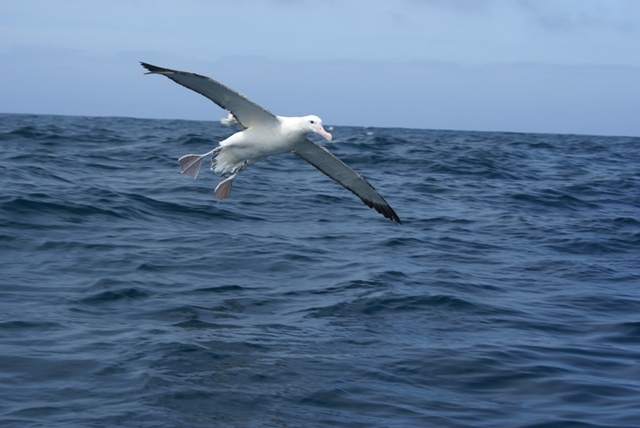 So lots of pictures of albatrosses! And again, but a bit closer. And closer still! They love snoozing - we had to either step over or walk round this one. 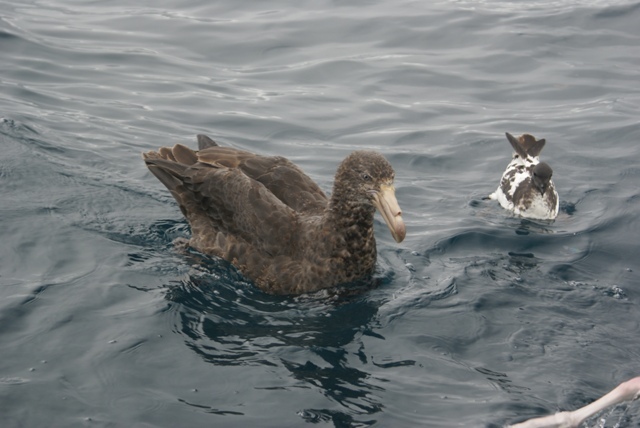 shows how big the Giant Petrel is. The first Albatross comes in to land. just how big the Albatrosses are. Couldn't get much closer to an Albatross in the wild!